The following is a known issue with HEC-GeoHMS 10.0, 10.1. Problem: Errors when running tools from HEC-GeoHMS toolbar. Workaround: Do not enable the Background Processing option on the Geoprocessing Options editor. 2. Make sure the Enable checkbox is not checked under Background Processing. If background processing was checked then start the GeoHMS project over. The following is a known issue with HEC-GeoHMS 5.0, 10.0, 10.1. Applies To: Versions 5.0,10.0, 10.1. 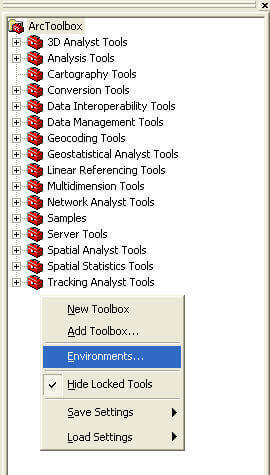 Problem: Error when running tools from HEC-GeoHMS toolbar. Try closing the ArcMap document and deleting all files in the TEMP folder. Then reopen the ArcMap document and try running the tool that resulted in the error. To delete the contents of the TEMP folder follow the steps below. 2. Type the following, one at time hitting ENTER after each line. Applies To: Versions 4.2.92 & 4.2.93. Problem: Issues when creating new project in HEC-GeoHMS. To use HEC-GeoHMS with ArcGIS version 9.2, you must start the ArcMap document and your HEC-GeoHMS project by following the steps described in the PDF document. If you do not follow these steps, then you will not be able to create an HEC-GeoHMS project after finishing the Terrain Preprocessing steps. Click here for instructions on creating a new project successfully with HEC-GeoHMS 4.2.92. Problem: Errors when running tools from ArcHydro or HEC-GeoHMS toolbars. Make sure the Arc Hydro Document is correctly set in the ArcToolbox Environment Settings. 3. Choose the Environments… option.